Credit: Photo by Anthony Shillito. Boulder, Colo., USA: Our understanding of when the very first animals started living on land is helped by identifying trace fossils–the tracks and trails left by ancient animals–in sedimentary rocks that were deposited on the continents. Geoscientists Anthony P. Shillito and Neil S. Davies of the University of Cambridge studied the site of what has widely been accepted as the earliest set of non-marine trackways, in Ordovician (ca. 455 million-year-old) strata from the Lake District, England. 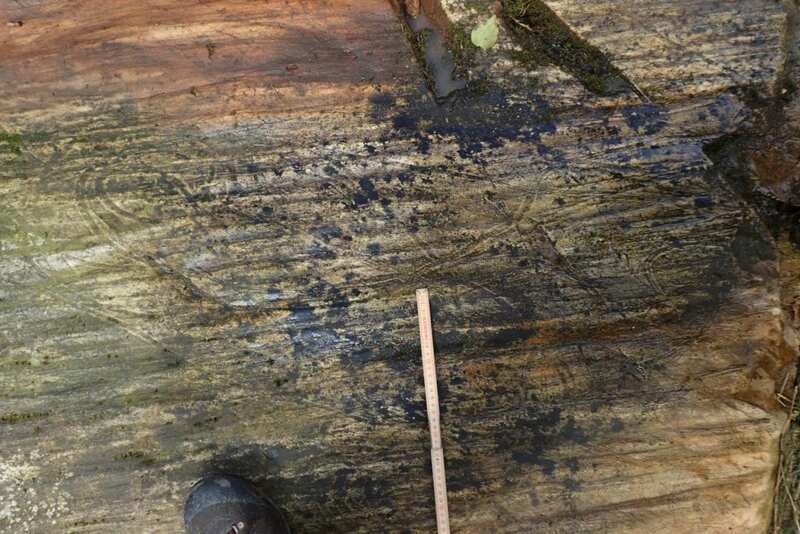 What they discovered is that the trackways occur within volcanic ash that settled under water, and not within freshwater lake and sub-aerial sands (as previously thought). This means that the site is not the oldest evidence for animal communities on land, but instead “is actually a remarkable example of a ‘prehistoric Pompeii’,” says Shillito–a suite of rocks that preserve trails made by distressed and dying millipede-like arthropods as they were overcome by ash from volcanic events. Shillito and Davies directed their research at this site in particular because it seemed unusual–at every other known trackway site in the world the evidence for when animals came onto land dates to the latest Silurian (ca. 420 million years ago), so something about the Borrowdale site didn’t seem right. Further investigation proved that this was the case. In the course of their study, they found 121 new millipede trackways, all within volcanic ash with evidence for underwater or shoreline deposition. Volcanic ash is known to cause mass death in some modern arthropod communities, particularly in water, because ash is so tiny it can get inside arthropod exoskeletons and stick to their breathing and digestive apparatus. Shilllito and Davies noticed that most of the trails were extremely tightly looping–a feature which is commonly associated with “death dances” in modern and ancient arthropods. Understanding how life engineered major evolutionary advances within environments, and the rate and impact of these advances on the functioning of the Earth system, provides vital context for understanding global change at the present day, and underlines the inseparable relationship between life and the planet. Anthony P. Shillito and Neil S. Davies, University of Cambridge. Contact: [email protected] Geology, https://pubs.geoscienceworld.org/gsa/geology/article/567352/death-near-the-shoreline-not-life-on-land.